Found 7 file extension associations related to DesignCAD and 5 file formats developed specifically for use with DesignCAD. 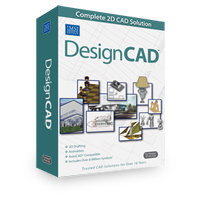 DesignCAD is a versatile and easy-to-use CAD program is designed to help you get started quickly. Powered by TurboCAD, trusted for over 20 years with over 2 million users worldwide, DesignCAD produces accurately scaled architectural and mechanical drawings allowing you to create, edit, scale, move, rotate and copy individual objects. A full complement of 2D drafting and design tools, including drawing layers, snap, hatch patterns, and full dimensioning capability. Collaborating on a project? Easily import/export editable DXF/DWG files without the risk of data loss or corruption. If you need more information please contact the developers of DesignCAD (IMSI/Design, LLC. ), or check out their product website.